If your iPhone voicemail box gets hit up constantly and you actually listen to the messages, each voicemail message gets downloaded locally to the iPhone and takes up some storage space. For most users, this is usually an inconsequential amount of data ranging from 5MB-100MB, but for those who send a lot of calls directly to voicemail and have tons of locally stored messages, or whose message leavers dump a 15 minutes rant onto your voicemail, you may find the size to become a nuisance. Fortunately, it’s easy to clear out voicemail from the iPhone either with a single message or with multiple at a time, so whether you just want to declutter the iPhone a bit, lose that lengthy weirdo message someone left on your phone, or simply restore some additional storage capacity, you’ll find it just takes a moment or two to complete. You can also choose the “Delete” option after you have listened to a message, though that isn’t as fast. 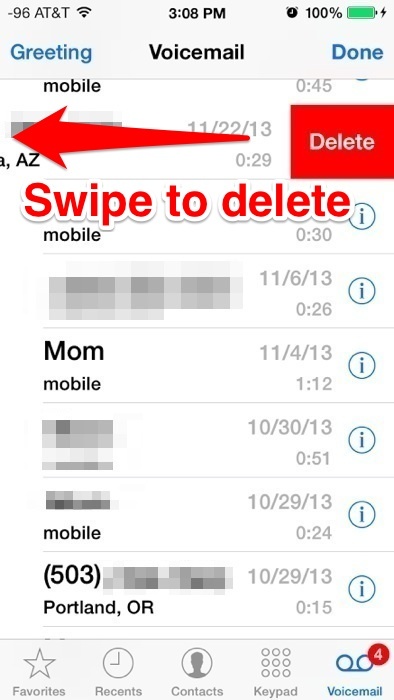 Optionally, you can use a little-known multitouch trick to quickly delete multiple voicemails at the same time. This is probably the quickest way to clear out the entire voicemail inbox there is, and it’s really easy to do. 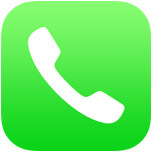 Deleting voicemail from the iPhone also removes it from the voicemail server, at least with most cellular providers, thus you should only clear voicemails after you have listened to them and deemed them not worthy of keeping. That may sound obvious, but because of this trick to recover accidentally deleted voicemail messages that are still stored on the device (i.e. ; hasn’t been rebooted yet), some users have been baffled to find that not all voicemail is recoverable that way. 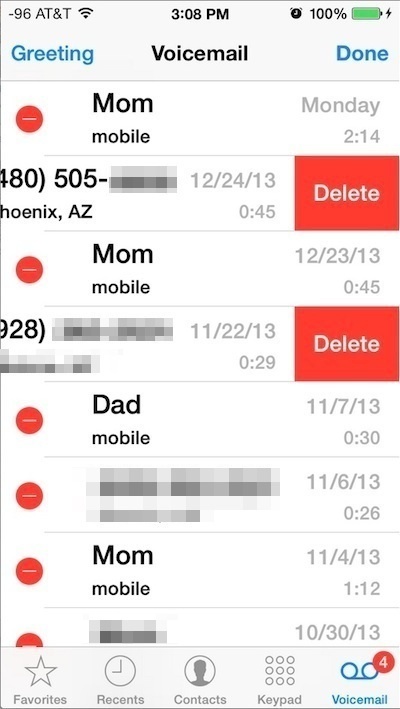 In some situations, deleting all voice messages can function as a secondary approach to resolving the Visual Voicemail Unavailable error message, though you should manually check voicemail by calling your own number before doing this, otherwise you may end up losing it without ever hearing the recording. The Voicemail storage usage list isn’t actionable, but it will tell you exactly how much space you’ll get by deleting the messages stored on the phone by using the above tricks. Prior versions of iOS used to bundle Voicemail data as part of the “Other” space that seemed to universally confuse everyone, but now with it separated it’s very easy to determine if you’ll gain any meaningful storage by trashing the local messages or not. In the screen shot example, 4.7MB is obviously quite small, but I’ve seen the Voicemail portion take up 800MB on an iPhone before, so it ultimately depends on how much voicemail you get and how often you tidy up. I have a weird issue where I can’t delete voicemail at all, and the screen becomes unresponsive when trying to scroll in the voicemail window of the iPhone. Ever see that? Any ideas? Happens even after quiting the app. The same thing is happening to me. when i swipe from left to right to delete it re-appears, any idea how to permanently remove it. can’t get a voice message to delete – i can delete it but it reappears instantly. you have to start from the oldest to the newest. I figured this out MYSELF!! I’m a freaking jeeenius. This is only relevant in the US and nowhere else. If you wish to provide tips in a global sense, please make a note that tips like these are US only. Unless you wish to confuse people who don’t know the difference? There is the rest of the world out here too. Geography lessons in the US must be very short, when you leave the rest of the world out. Sadly some bloggers forget they write to a world wide audience, yet focus on just one country. Pretty ignorant if you ask me. At least it’s the one country that matters. So there is no way to simply delete all the voicemails at once? I have hundreds of voicemails. What are “multiple touch points”? And, like other visitors have asked (but never had answered), is there a simple way to select ALL voicemails and delete ALL of them at the same time? No, there is not a way to select all voicemail on the iPhone and delete all of the voice mails at the same time. That is a limitation in iOS on the iPhone, you must manually select each voicemail to remove them, or use the multi-touch feature to delete two or three at a time. “multiple touch points” means using multiple fingers, or, ‘touch points’ since some people use a stylus, etc. Hi, I have an issue with my iphone..I deleted all my voicemails but now no one can leave me a voice mail. I can’t create a personal voice message either. It’s telling me there is no data for a voicemail but I had one before I deleted the messages..Please help. I am in the US. Have an Apple S4. When I edit and swipe to delete the voice mail it goes away then comes right back!!!! I can not clear a voicemail! And help?? There is no way to delete all voice mails at once. At least not on the iPhone 5. Yet another poor GUI design by Apple. Amazing actually. Did I miss the answer? I know how to delete voicemail but it is not working. When I swipe to delete the message goes away and then returns, and my box is full and has stayed full even when I got a few messages to delete. Help! Yes, I have the same problem with my iPhone. I swipe left on my voicemail, click on delete and it disappears only to pop right up again two seconds later. Annoying. I cannot get rid of one particular voicemail I want to delete. I have tried all of thes ways to delete the message mentioned above and it keeps reappearing. I have an IPone 6S plus. Please help!!!! I have a voicemail that I cannot delete. It pops right back in the que after I delete it. How do I fix this? How to erase my vioce mail store my iphone 8 plus? I need help with these.How to eras my voice mail and return to original msg of the phone. I have iPhone 6s. Is there a way to clear/permanently delete the voice messages in the Deleted messages folder of my voicemail (without deleting any of the voice messages in my inbox)? The Clear All option at the top of the Deleted messages folder, which you’d think would be the way, doesn’t seem to do a thing. I currently have no room to receive new voice mails, and was hoping clearing out my Deleted messages cache would open up room. Thanks. My 6s also will not permanently!’, delete voicemails. I’ve done each of these steps SEVERAL times. I have an iPhone 6 and cannot delete an old voice message. How do I delete it? I cannot delete a voice mail using the Edit or swiping the delete? ?